The government has made significant progress in disclosing the status of implementation of promises in the budget 2017 in the last six months of 2017 and beyond, compared to the first half, a leading think-tank in the country said. 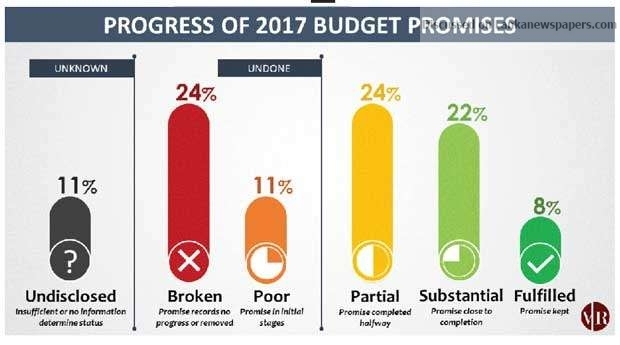 According to the latest budget promise tracker by Colombo-based Verité Research, which tracked 37 budget promises of budget 2017, the implementation status of only 11 percent of the budget promises is unknown, compared to the 51 percent recorded in the previous budget promise tracker up to June 30, 2017. “Overall, compared to the first six months, the government has done ‘OK’ particularly in terms of disclosure,” Verité Research Assistant Analyst Nilangika Fernando told reporters in Colombo, yesterday. However, the government has been able to fulfil only 8 percent of budget promises while the status of 35 percent remains broken or incomplete. The implementation of about 46 percent of the budget proposals is either halfway completed or close to completion. Verité Research Research Director Subhashini Abeysinghe pointed out that despite the relatively improved transparency, the government has only utilized Rs.55.4 billion of allocated funds under the budget 2017, out of Rs.116.9 billion. “The allocations are different to what they are actually planning to do and what’s actually happening. The question is where the money went. We don’t know what happened to Rs.21.9 billion, which was not disclosed whatsoever,” Abeysinghe said. However, she noted that by disclosing this information to the public, the government could build credibility while gaining the trust of the taxpayers. Abeysinghe stressed that the transparency of government expenditure and tax evasion is directly linked. Meanwhile, commenting on the quality of some of the budget proposals implemented, Fernando said the public is yet to be aware of the full details. Verité Research also pointed out that during election cycles, the expenditure in sectors such as agriculture and education tend to go up, beyond the budgeted allocations, as politicians know that additional funding to such sectors can surely influence the voting patterns. “The agriculture has been a sector which has been highly politicized. As a result, what you see is, due to lack of accountability, at the time the government presents the budget, the government promises a lot of money. 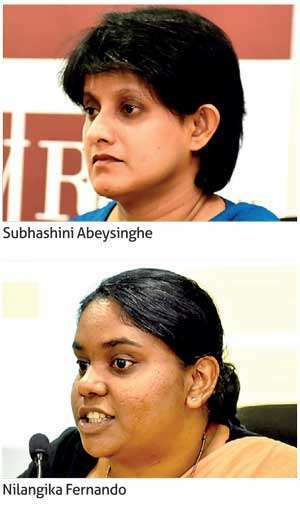 And with a lot of money, they bring a lot of promises on to the table misleading the farmers,” Abeysinghe said. The government expenditure on agriculture and irrigation was as low as 40 percent of the allocated budgeted amount in 2013, while in 2015, the expenditure on agriculture and irrigation was little above 14 percent of the budget allocations. “This allows the government to deceive the public for political mileage and break budget promises and get away without being questioned or being held accountable. Though we launched the budget tracker last year, this is not a problem that is unique to this government. This is a perennial problem and this has been the case for successive governments,” Abeysinghe added. Verité Research’s budget tracker was limited to physical implementation of budget proposals rather than utilization of allocated funds and budget proposals with over Rs.1 billion fund allocation.